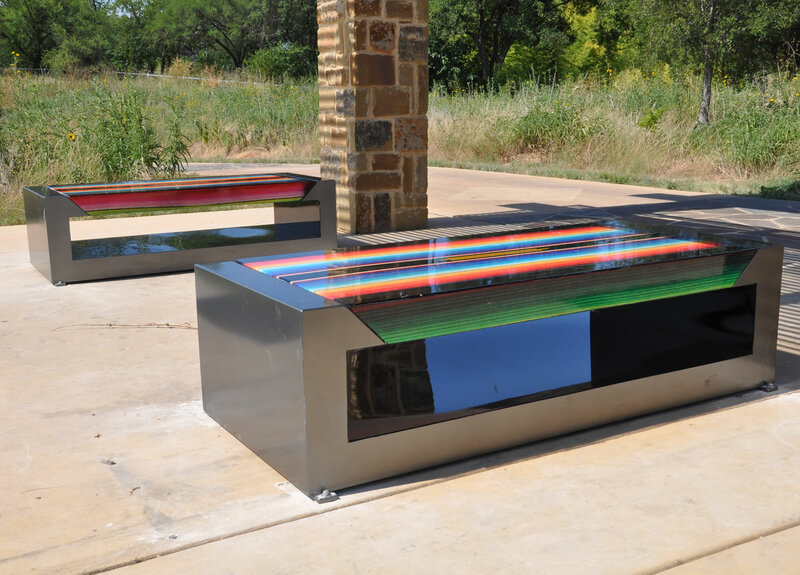 Drawing on elements of Latino culture in south Texas, Valdez’s art bench was inspired by two very different sources: the opening of the movie 2001: A Space Odyssey and two vintage serapes given to him by his grandmother. The movie sequence reminded Valdez of how rapid change and development can often replace the old with the new, but the San Antonio River Improvements Project ultimately merged the old and the new to create an inspiring space. The vintage serapes inspired the palette of colors featured on the bench, the design of which also references custom car design with sleek, automotive pinstripe detailing that wraps around the entire seat portion of the bench. A longtime fan of low riders and the custom art pinstriping featured on the cars, he collaborated with San Antonio’s Get It Up Productions to fine tune the bench striping. Our special thanks to Patricia and John Smothers for donating this art installation.